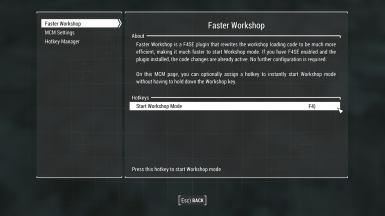 Faster Workshop is October's Mod of the Month! Thank you all for your endorsements and votes! Q: Does this mod conflict with [x mod]? A: This plugin very precisely targets native code that handles workshop loads. It can only conflict with other DLL-based mods that target exactly the same code regions, and there are no such plugins that I am aware of. This mod will not (and cannot) conflict with any script-based mods, so they will work perfectly fine together with this mod. Mods such as Workshop Framework and Workshop Plus work perfectly fine with this mod. Q: My workshop icons load slowly, will this mod help? A: This mod does not improve workshop icon loading speeds. However, there is a vanilla issue where icons for submenus will not even start to load until you have stopped navigating through the Workshop item carousel. If you are navigating quickly through menus, this additional delay will be noticeable as you will have to stop navigating before the icons begin to load. This mod fixes this issue and removes the initial load delay, so you may see icons appearing faster as a result. I'm sure you already have a job in the field of programming, but they should pay you more. Amazing work man. Oh man! Thanks a lot! A masterpiece of coding! Saves me lots of time and removes a very annoying element from Fallout! Opening workshop time went down from more than three minutes to some seconds. Just WOW! Can only recommend it! Guess they didn´t see it comming, that some people would max out the workshop menu with so many user created objects, that the code they used -which works fine for the workshop as they gave it to us- wasn´t able to handle anymore. Thank you. Your name is notorious. Holy crap this is amazing. Well done. It was getting to the point where I HATED entering Workshop mode because it would take so long, now the second I hit the Workshop key, BOOM!! the Menu is open, and there are ICONS!!!! This mod has made an enormous difference in the overall workshop mode. It basically saves spent time on one's life waiting - and the many other mods associated with this author and colleagues have improved the game as well. Bravo, and thanks to all of you. Can the "hold F" command also be unassigned from opening the Workshop Menu? I like looking at my character inside settlements and it's not possible since holding the F key is double-assigned, like so many other keys.